Here is the list of the 9 best Sports Addons for Kodi as in 2019, on these addons you will be able to watch many kind of sports including football, NFL, NHL, UFC. 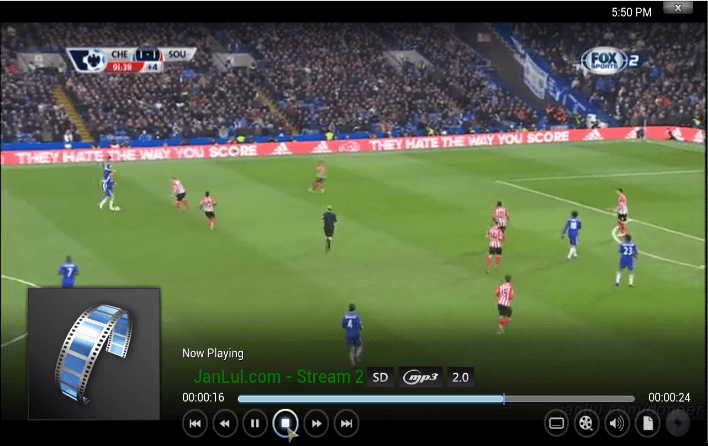 Nowadays live streaming sports are very popular as there are many exclusive matches from premium channels. This year many Kodi Addons transmitting live sports events have been targeted by some big ISPs and forced to close down (Phoenix and Navi-X were the biggest exits until now). Fortunately there are still addons to watch Sports TV Channels or Streaming by event. You can go through this list, try them and keep your favourites. Here is the list of the 9 Best Sports Addons for Kodi. I’ve sorted this list based on my own personal preference based on how easy it is to use and also how versatile overall. If your list is different or you have some others that should be included, please let us know in the comments below. Probably the “grandaddy” of Kodi sports add-ons, SportsDevil seems to have something for everyone. Everything is nicely sorted into categories for you with SportsDevil and it’s really easy to find what you want. Check out our install guide to get started. If you’re a fan of sports, then this is definitely one add-on that you want to get. More of an all-in-one add-on than one purely dedicated to sports, cCloud really does have something for everyone! With cCloud other users add streams so there is lots of International content including sports that you might not find in other add-ons. The channels lists specify the country so it’s easy to use your VPN to make sure that you have no issues watching the content. Check out our install guide for cCloud to get started. Who doesn’t love some good old fashioned “wrassling”?! For WWE content only, you really cannot go wrong with WWE On Demand. With access to replays from past events and also the latest PPV blockbusters, WWE On Demand is one of the best out there. Check out our detailed install guide for instructions and more information. UFC or MMA is probably the hottest thing in sports right now so if you’re a fan of the action, you’re going to love this add-on! With Planet MMA you have access to all of the major events. Watch UFC Fight Night, Fight Night Live, Contender Series, Ultimate Fighter Series and lots more! Planet MMA is built around the fast-paced action of MMA and the UFC so it should definitely be your first point of call if you’re a fan. Check out the detailed installation guide for information on how to get it onto your system. Probably one of the best add-ons if you’re interested in the major US networks. USTVNow offers access to Fox, NBC, CBS, ABC and a host of other channels. Check out our detailed install guide for additional instructions. Again this isn’t a dedicated sports add-on but there is lots of great content available on live TV and its worth using USTV Now to get access to it. While Halow offers more than just football with access to movies, sports replays, and even music and live TV, it has lots of premium football (soccer) content. The quality of the streams is generally very good and it has an excellent overall reputation. Click the link for detailed installation instructions for Halow Live TV. This is one of the newer sports add-ons and it offers a mix of different sporting events. You can access soccer, wrestling, the NBA, WWE and lots more with Sportie so it’s definitely worth exploring. Check out our install guide for more details on how to get it onto your system. Bennu is a good add-on that offers access to lots of NFL games. You can also watch NFL on USTVNow (which we talk about later) but sometimes some games are unavailable based on viewing rights. In those cases, Bennu fills in the void quite nicely. Check out our install guide for Bennu here. Do you follow NBA, NHL and/or NFL? If you do, this is the right add-on for you! Pro Sport add-on uses Reddit to get the stream links, they don’t host anything. There are many Reddit Communities experienced in live streaming so you will always get updated streams from big online communities. We’ve got an install guide that you can review for more information. Important note: If you want to watch a channel from other country you will need a VPN to change your location to that country as most of the channel streams on the internet are geo-blocked. Even if you want to stream a channel in your country is highly recommended to use a VPN to keep your traffic anonymous as your internet provider may not like it and block your access or slow down your connection. Check here for the best VPN to watch live sports. Looking for an Android TV Box? Find here a comparison table with the Best Android TV Boxes 2019. The streams are always buffering? That normally means that your ISP is blocking the stream source or is slowing down your connection while you stream. For eg. UK ISPs are partnering with the Premier League to block access to football streams. Also, if you’re trying to watch a channel from another country you will need to change your IP Address to that country. If you don’t want your ISP to spy on your traffic, block streams, slow down your connection or be geo-blocked, you can subscribe a VPN. There are a couple of VPN’s that you can use with Kodi, however, there is only one that stands out as the best VPN for kodi >> IPVanish. We’ve arranged an EXCLUSIVE deal with IPVanish to give our readers 57% discount. Access All Streams With IPVanish! I just put that article on my list. Thanks for your suggestion. whats the best kodi build with live sports? I am looking for a sports addon for college basketball. Does anyone know what APPS show the BIG TEN channel? UFC finest is great! Need more bellator. I have just installed the M9S box but as a real geek, cannot find the correct sports app, I have found Turks and one other but are there other names of the sports apps that I should look for. Install No Limits Build,it’s got everything on it,best I’ve seen this year. Thanks for explaining the addons list actually i really want a post which describe this beautifully so i can share it with my customers and this is the perfect post for me and the users.I definitely share it. Thanks for this sports addons list! Great job! I’m trying them all, I’ve already found some that will be my favorites for sure! !